Join me on the journey to lean body, soul, spirit, and all that is my life. ← Exercise Any Time and Any Where! Champagne Grapes are a beautiful little fruit, but their name can be deceptive. No, they are not used to make champagne and they are not from the Champagne region of France! So, why “Champagne Grapes”? Stories vary, but they were either photographed with a flute of champagne or named after their resemblance to tiny champagne bubbles. Champagne Grapes were originally known as Corinth Grapes, as they are one of the oldest varieties of grapes produced and were originally grown on the Island of Zakynthos (or Zante), off the coast of Corinth, Greece. And, if you didn’t already know, dried Champagne Grapes are commonly known as Currants! Ever heard of Zante Currants? Well, now you know. Growing up, my great-grandmother made a fabulous Currant Butter Tart! The recipe has been passed down for over a hundred years now in my family! After college, I spent a summer on a mission trip in Latvia and Poland, and they sold Black Currant Juice in little glass bottles. It was fabulous! And all this time, I had no idea that Currants and Champagne Grapes were the same fruit! 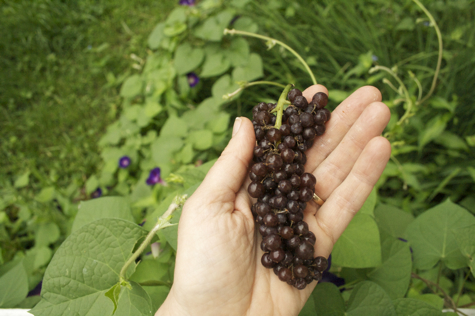 I can’t help but add my first memory of currants: watching Anne of Green Gables! Remember Marilla’s Famous Red Currant Wine that Anne mistakenly gives to Diana instead of the Raspberry Cordial?! Well, here’s a snippet from the scene along with Marilla’s recipe, if you dare! Mrs. Barry: Marilla, I don’t believe a word. Anne Shirley is a conniving, manipulating child and she’s pulled the wool over your eyes. Rachel Lynde: I always warned you about making that current wine, Marilla. You said it wouldn’t have the least effect on anyone. Well, I ask you. Marilla Cuthbert: It isn’t meant to be drunk three tumbler-fulls at a time! And if I had a child that was so greedy, I’d sober her up with a darn good spanking! Mrs. Barry: Oh! So it’s my Diana’s fault, is it? Marilla Cuthbert: [Marillla quickly then cut in furious anger] My current wine is famous all over the island, Rachel Lynde, as you very well know. And the Reverend Allen himself is not opposed to taking a bit when he comes calling. And as for Christian virtue: making a little wine for a refreshment is far less sinful than [then shouted extra loud, speaking] meddling in other people’s affairs! Rachel Lynde: [in shock] Oh! Champagne Grapes can be eaten straight off the vine, cooked into sweet treats (like the Cream Scones with Champagne Grapes recipe on this week’s meal plan), made into juice or wine, or added to savory dishes (like the Champagne Grapes and Shrimp Salad Sandwiches orPan-Seared Scallops with Champagne Grapes and Almonds). Any way you eat them, they are delicate and sweet! Bon Appetit! This entry was posted in Organic and tagged champagne, champagne grapes, corinth grapes, currants, grapes, produce, spotlight, zante. Bookmark the permalink. oh those grapes are so pretty! Enter your email address to follow this blog and receive notifications of new posts by email. Select daily, weekly, or immediate updates! Link your site to My Journey To Lean.